Gradually they arrived at the designated Adventure Caffè. Ghost Bunny was in attendance and so that no one would be alarmed, had disguised herself as graffiti. This worked up to a point. But from time to time she shrieked, "What was that for a haunting sort of Adventure?" Several passersby jumped. 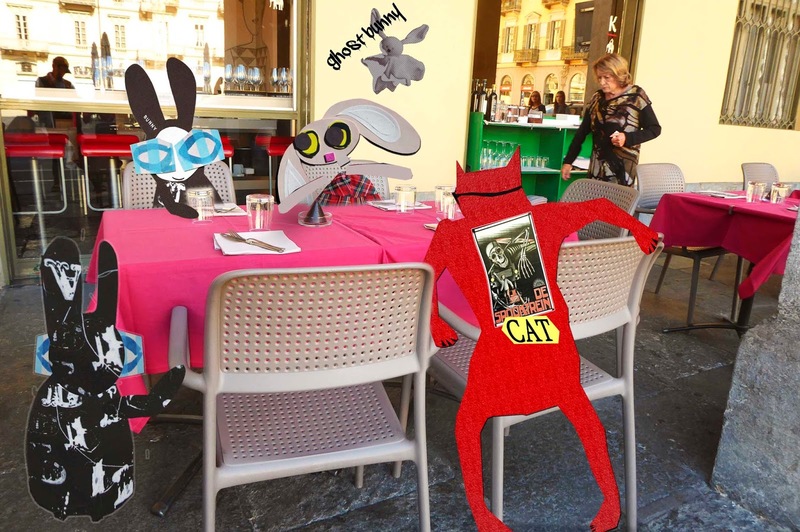 The Wabbit pretended not to hear - and instead examined his glass. "Is my glass half up or half down?" he said in a serious philosophical tone. The proprietor arrived with a frown and apologised. "Sorry about the graffiti, a horde of drunken soccer fans thought it was carnival." 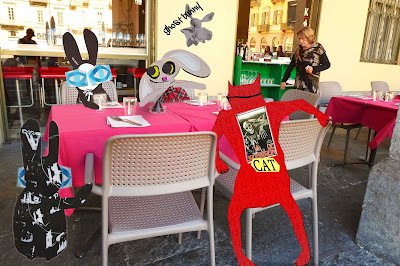 The Wabbit pointed at the glasses. "Subito, Commander," said the proprietor. With an impatient gesture she was gone. Ghost Bunny watched her vanish and fluttered until a spooky wind blew down the porticos. Skratch meaowed, "You watch too much television, Ghost Bunny." Lapinette butted in. "Ghost Bunny is reading Film Technique by Pudovkin, which I lent her." "Wooooooh," sighed Ghost Bunny. "Wooooh Woooh!" laughed Skratch. Wabsworth suddenly pushed a chair. Metal legs screeched on the sidewalk. "That adventure was composed of exact plastic content, each piece of which should be contextually interpreted." "Explain!" challenged the Wabbit. "Oh, that would take a big, big dinner," said Wabsworth slyly. The Wabbit made a mental calculation and mulled it over. "OK. House of the Devil at 21:00. On expenses." "May I haunt along?" shrieked Ghost Bunny.